02.10.11 - 41/365, originally uploaded by Sarah (SarahDanyelle). I am loved. Or spoiled so my mom would say. My Valentine's day present showed up today at my office. 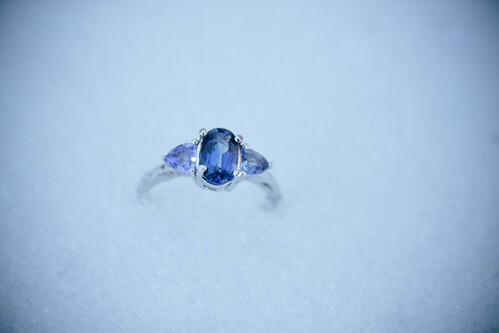 It hails all the way from Australia and is saphire (my favorite gem) and tanzanite. And do you want to know what it's sitting on? Snow. Um, hello, I thought I lived in Texas. In a two week work period we have had five snow days. It's just craziness.